All Savage kettles are SPUN from the highest quality copper or stainless steel to assure uniform thickness and precise hemispherical shape. 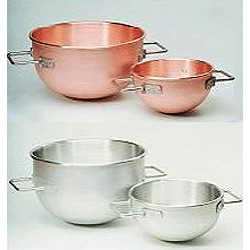 They are designed for heavy-duty use with stainless steel handles and reinforced handle mounts. Each kettle is balanced for easy lifting and pouring, and direct pickup off stove or FireMixer with Savage LifTILTruks. Convenient roll-around dollies are also available. Copper is preferred by candymakers for most sugar based confections - "browns" sugars the best!